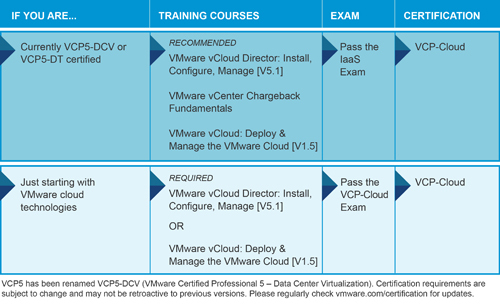 So this morning I took the VMware Infrastructure as a Service exam (VCPVCD510) to gain the VCP5-Cloud qualification. The IaaS exam is available for existing VCP5-DCV holders to take without any other pre-requisites. I am very pleased to say I finished the exam in good time and scored 466⁄500 – the pass mark is 300. The exam itself is 85 multiple choice questions, and gives you 90 minutes to do them. The last two exams I’ve sat were VCAPs, which require you to move very quickly through the questions, so I am in the habit of answering quickly: I finished with over an hour to spare! The questions and answers are not particularly wordy but it is important to read carefully and pick out the important information. In my opinion the questions are straightforward and fair – I’ve not found any VMware exam has been trying to trick me or mislead me. The exam interface allowed me to move back and forward through the exam, and flag questions for review. I’ve always found my first answer to be the most reliable, and that reviewing questions only made me question myself – that said, some people like to review and go back – the choice is yours! With vCD I’ve found it useful to remember where things belong – e.g. Users are typically part of Organizations, Hosts/Clusters/Resource Pools are part of Provider vDCs. It helps a lot when remembering where and how things should be configured, you can apply logic to most questions. Similarly, it’s widely written that one of the keys to understanding vCD is understanding the networking – once you get a grasp on that, the rest falls into place a lot easier. VMware Chargeback is a heinous product, but it is part of the exam and you need to understand the different cost models and hierarchy, how costs are applied – probably a learn-and-forget experience but it is required. Lab – I installed vCloud Director, vShield Manager, VMware Chargeback in my lab. It’s an environment you can play with, break, fix, break again (and kill!). If you can’t have a dedicated lab then try and use Workstation to build one. Familiarity will only come from using it, and you’re unlikely to use all options even in a production environment. Gregg Robertson’s VCP-IaaS and VCP-Cloud resources page has an absolute ton of resources, definitely worth going through that too. Exam Blueprint – as ever the exam blueprint covers every single subject that you’re required to know for the exam – if you’ve not gone through it and checked everything off then you probably should fail! You can also take a practice exam that’s linked from that page. I also used the VMware Partner Central training course for my VTSP-Cloud – the Pluralsight course will give you a similar grounding if you don’t have access.